Long Gulch Lake in the Trinity Alps. The northeast corner of the Trinity Alps is often overlooked when it comes to hikes in the Mount Shasta area. With trailheads just a little over an hour from Mount Shasta City, this area is still well within a reasonable orbit for dayhikes from town. It is an easy, scenic drive over to Callahan and then just a few minutes from the small town to the numerous trailheads in the area. 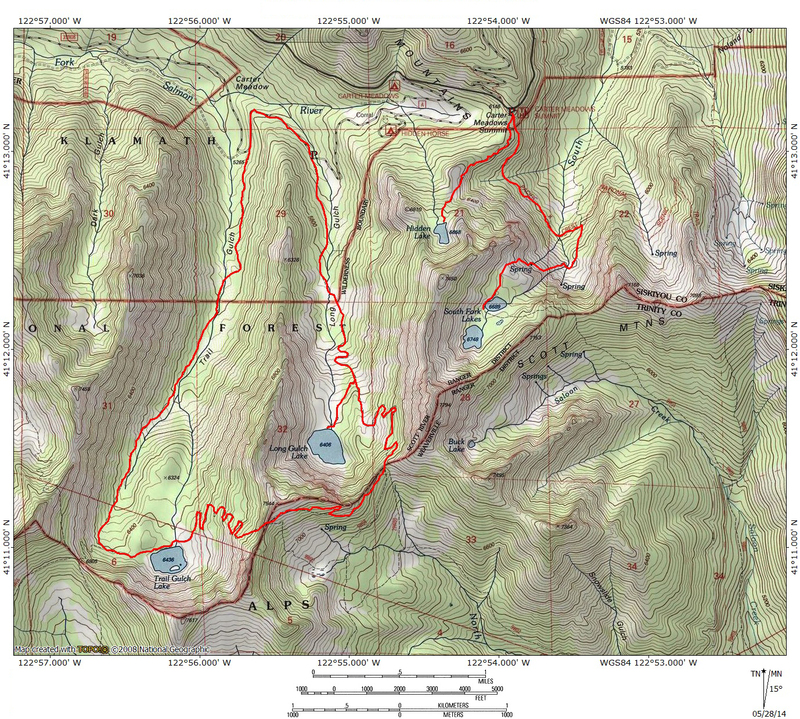 Most of the trails in the area climb up drainages in the Scott Mountains, which forms the northeast breastwork of the Trinity Alps Wilderness. This mountain range actually begins by Mount Shasta and extends westward, the western section falling into the large wilderness area that encompasses the Trinity Alps. While not as grand as the high, alpine region that lies at the granite heart of the Trinity Alps, this section of the Scott Mountains is loaded with fantastic scenery. The trails here typically run parallel to creeks as they climb up to lakes that lie at the head of their drainage. Consequently, most of the trailheads only provide access to one area. The great exception to this is the Carter Meadows area, which is the beginning to three great hikes. Though all three trails lead to lakes, it is surprising how different they are. The first two trails, the South Fork Lakes Trail and the Hidden Lake Trail depart from a single trailhead and are both fairly short hikes. The former is a pair of small but fantastic lakes in a hidden lake basin. Rocky and vertical, the secluded basin is spectacular. In contrast, though Hidden Lake is impressive, it has an open, homey and accessible feel to it, though it is still quite scenic as well. Located just a very short drive away, the Gulch Lakes Loop is one of the best hikes in the Trinity Alps, complete with two excellent lakes and canyons with some beautiful meadows and great long-distance views sprinkled in for good measure. Though longer than the other two trails combined, the Gulch Lakes Loop is not difficult and makes for a great full day of hiking. In between the two trailheads is the Carter Meadows campground. If making the drive from Mount Shasta (or elsewhere!) and back in the same day is unappealing, then it is possible to do all three trails in a single weekend with easy, scenic camping right by the trailhead. There is also a horse oriented campground with a corral a short walk away from the Carter Meadow campground. These facilities make the Carter Meadow area a convenient, albeit extremely scenic place to enjoy some solitude and great hiking. Constituting the headwaters of the South Fork of the Scott River, the South Fork Lakes, though small, are fantastically scenic. Tucked away in a high, hidden cirque at the foot of a triple divide peak, the lakes are at once remote yet quickly accessible from the trailhead. 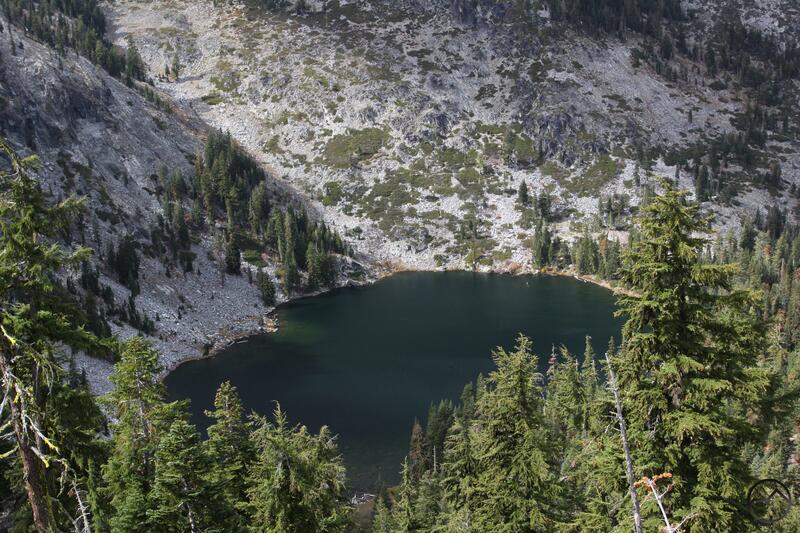 The lakes are not large by Trinity Alps standards but the upper lake’s depth of 34 feet is impressive. This is significantly deeper than other similarly sized lakes in the area. Though the South Fork Lakes are a fairly short distance from the trailhead, there is one notable obstacle that confronts hikers looking to enjoy their tranquil waters. After peeling off of the PCT, the South Fork Lakes Trail enters a large cirque with tall cliffs towering more than 800 feet overhead. To reach the lakes, it is necessary to surmount the cliffs. Fortunately the climb is made more palatable with some great views of the Scott Valley to the north and a large complex of springs. When the trail finally levels off, hikers are deposited in another large cirque lined with ragged cliffs. It is only a short jaunt to Lower South Fork Lake. It is a pretty body of water but is no match for its higher sibling. Here the cirque headwall emerges directly from the upper lake’s water and soars over 1,000 feet above. The rocky cliffs are quite dramatic and well worth the effort necessary to reach the excellent spot. Distinctive because it is one of the shortest hikes in the Trinity Alps, the Hidden Lake Trail packs in far more scenery than its short duration would lead hikers to expect. Beginning at the same trailhead as the PCT section that leads to the South Fork Lakes Trail, the path to Hidden Lake boasts some grand scenery fairly quickly. A succession of basins and peaks extends to the west, all lining the rim of the headwaters of the South Fork of the Scott River. Hidden Lake itself is not part of the Scott River watershed. It is instead one of the initial sources of the laboriously named East Fork of the South Fork of the Salmon River, one of the large tributaries of the massive Klamath River. The trail actually climbs the divide between the headwaters of these two river systems. Beyond the views the trail climbs steeply up to the lake, where tall, dark cliffs tower over the small lake. It is hard to believe that such a fine destination is only 1 mile away from the trailhead. Though it is tucked away in a far corner of the Trinity Alps, the Gulch Lakes Loop boasts some of the finest scenery of any of the trails located in the Trinities outer periphery. Looping through two deep canyons lined with sheer cliffs and sharp pinnacles, the trail passes through beautiful meadows and alongside raucous creeks. 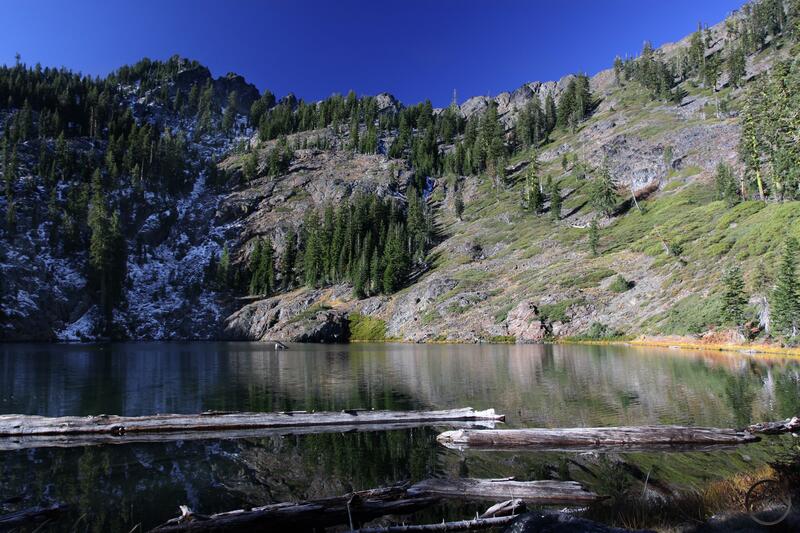 The Gulch Lakes, unceremoniously named Long Gulch Lake and Trail Gulch Lake, are crystalline jewels nestled at the foot of tall granite cliffs. Each lake is located at the head of their respective canyon (or gulch, as it may be) and are drained by their separate and eponymously named creeks. The loop trail is completed by climbing out of one canyon, traversing a ridge and then dropping back down into the adjacent canyon. While this does necessitate some climb, it has the bonus of adding some great long distance views to a trail that is otherwise found at the bottom of a canyon. The granite heart of the Trinity Alps is visible to the south while the large Coffee Creek drainage spreads out to the southeast. A highlight is a chance to glimpse the rarely seen rugged north face of Billys Peak, a very underrated mountain. Though the views are great and the canyons walls, meadows and creeks add a lot of interest along the trail, the true highlight of the loop is the pair of lakes. Similarly sized, both lakes rest at the foot of tall granite cliffs. One unusual feature of the hike is the opportunity to observe both lake from their shores as well as from vistas perched high overhead. It gives both a sense of limnic intimacy as well and grand proportion. 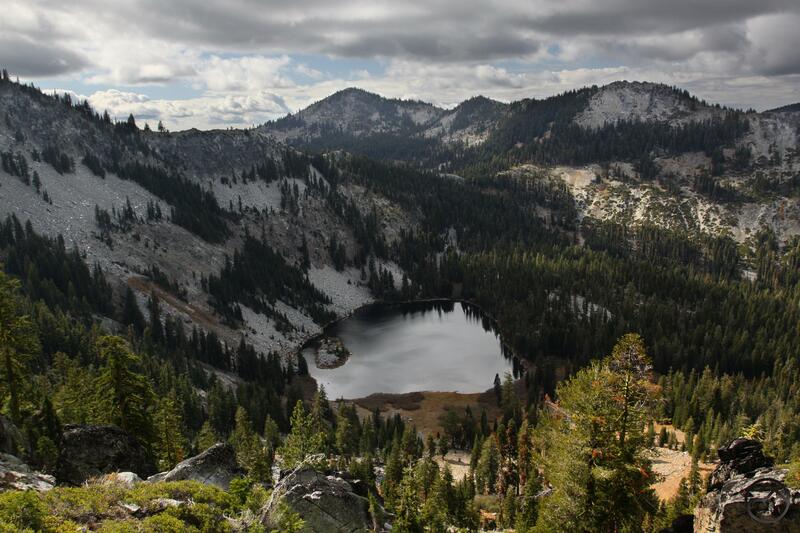 Taken together, this is one of the most view-packed and scenic hikes in the Trinity Alps. I do love being able to see a lake from a distance. It’s always a beautiful sight, but I also appreciate the opportunity to get the layout of the land before I stand on the beach. Then I feel like I have a better sense of where I am. The first photo is gorgeous! Would one of the Gulch lakes be good for a two day trip for small children who are good hikers? Any other suggestions that would fit that bill? We’ve been to Deadfall and are looking to branch out! Either of the Gulch Lakes would be a good choice, as would East Boulder Lake, the Little South Fork Lakes or Tangle Blue Lake. Those are all in the northeast corner of the Trinity Alps. The Marbles and Russians also have a number of lakes in that difficulty level. 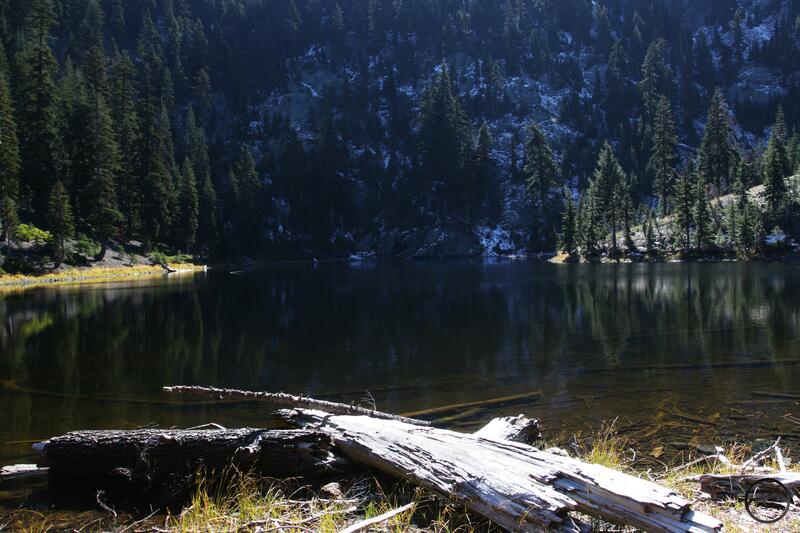 Closer to Mount Shasta, you might consider the Seven Lakes Basin or Porcupine and Toad Lakes. They are all fantastic hikes.